In case you missed it, we’re giving away a set of all four of the new Teenage Mutant Ninja Turtles Classics Figures. So we’re giving you a reminder to get your entries ready. Need a refresher on how to enter and win? Click the headline of the story for the details. So how do you enter? It’s simple, this is an Art, Customs, or Photography contest. We’re looking for your best representation of the Turtles in the Renaissance time period. You can add the Turtles to an old Renaissance painting, put them in Renaissance period attire, take them to a Renaissance Fair and and have them chowing down on some giant turkey legs and mutton! The choice is really up to you. Only criteria for content is the TMNT and the Renaissance mashed together. Be creative and have fun! Q. Who is this contest open to? A. Any registered members of Toyark.com, excluding staff. Q. What/when is the Renaissance? A. 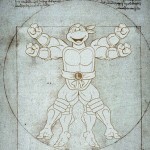 The Renaissance is the time period from the 14th – 17th centuries and is popularized by the artists from those times, including the artists the TMNT are named after. Q. Can I collaborate with someone else on a piece of art or custom? Q. I want to add one or more of the Turtles to an old Renaissance painting, can I? A. Yes. So long as the TMNT art, photo or custom figure(s) you are using to photoshop them in is your own creation. No taking TMNT pics from Google and submitting them here. Q. What size should my art or photo be? A. We have no minimum image size for submission. Basically, don’t submit a thumbnail and expect to win. Q. What kind of art can I submit? A. Pencil drawing, black and white drawing, full colored drawings, digital creations, 3D modeling, sculpture, collage, etc. This thread is for discussion of the contest, questions etc. So how do you enter? It's simple, this is an Art, Customs, or Photography contest. We're looking for your best representation of the Turtles in the Renaissance time period. You can add the Turtles to an old Renaissance painting, put them in Renaissance period attire, take them to a Renaissance Fair and and have them chowing down on some giant turkey legs and mutton! The choice is really up to you. Only criteria for content is the TMNT and the Renaissance mashed together. Be creative and have fun! A. The Renaissance is the time period from the 14th - 17th centuries and is popularized by the artists from those times, including the artists the TMNT are named after. A. We have no minimum image size for submission. Basically, don't submit a thumbnail and expect to win. A. We will only take into account a single photo, likely the first photo in your post, unless a specific image is marked as the "Entry". But you can add more photos to your post to show off details for the members to see. Q. I'm in the UK, can I enter? A. Yes, this contest is open to all of our member excluding staff. I definitely don't expect to win, but this'll be fun to enter. If nothing else, it'll be fun to see what everyone comes up with. UK residents able to Enter?? this is a clever idea! Who came up with it, and what gave them the idea? My idea. 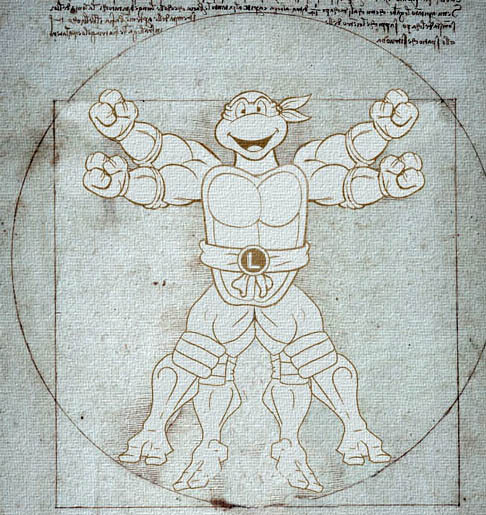 Was trying to think of something fun, and went with the tie-in with the turtles and the Renaissance. Just hope people have fun. Well, it's a great idea! And so obvious, too I'm surprised no one's done it yet. With hindsight, really surprised Toybiz never made toys of the turtles dressed as their namesakes. I might try to make something to enter, even. May give this a go if I can get the time to work on something. I'm gonna work on something this week, would love to win a set of these turtles. We've extended the contest until November 30th. Sweet, I was procrastinating on this, I got a great idea, just haven't had much freetime to work on it, I'll attempt some work this weekend on it, Would love to win these figures. To heck with the contest! You guys all right? Yeah, we're all good now. I believe everyone has their power back by now. A few people I know are still in a bad way due to property damage and lack of power, but thankfully no injuries. I'm from Mexico, I can enter right ?? I am making an Illustrator file.. hope that counts as art. We will ship to Mexico. Just output the Illustrator file as a JPG, GIF, PNG, etc. so it can be posted on the site. Good luck. Get those entries in, only a few days to go and only a couple entries, meaning there's a good chance at winning. almost finished with my entry! i sketched up a concept of how i wanted ti to look now im redrawing the final version, and inking it! it should be done in a couple of day, really hope i can win those figures love me some TMNT! I feel bad saying this, but I had completely forgotten about this...I did start a drawing, but it got set aside...Just now finished it up, but I've got some...special treatments I want to do before I do the finalized version. I'm being a bit more... elaborate than I need to be, but I shouldn't have too much trouble having the finished scan ready to submit sometime tomorrow. Can't wait to see what you guys enter. All-in-all I think I'm happy with the end result. I didn't quite capture the look of the original like I was hoping for, and I'm not confident that it'll be good enough to win, but...at least I've got a piece I can frame...I guess. That custom fig is really neat. I like the way he incorporated all four weapons. Been really busy with personal business, only just recently got to work on something. Wasn't really what I originally wanted to do, but I came up with another idea that I think might be pretty neat. Hopefully I can get it done in time. i managed to finish a day before the end date, its not excatly how i would like it, wish i had time to fully color it on photoshop, but i wanted to get my pic in on time. Last day for entries guys. Really like what I've seen so far. I still want to win (who wouldn't), but the other entries are rather impressive. The creativity to them is really good. I'm trying to not be overly harsh on myself, but I can't help but feel that mine is inadequate in-comparison. Like I said, I'm my own worst critic, but I'm sure there are others on here who could relate to that. Looks great guys, i too like the figure though it almost looks like a spider turtle. Thats a cool idea in itself!! Good luck to all! When will the winner be anounced?